On Saturday 15 December 2018, The Metropolitan Opera transmitted Verdi's La Traviata live to cinemas in seventy countries around the world. Michael Mayer's new production was quite a change from the former one which consisted mainly of a large clock telling of Violetta's limited time on earth. During the overture we saw Violetta as death overtakes her. Her life begins to flash before her eyes and ours. It was a very cinematic opening and the rising of a gauze curtain denoted the end of the overture and the real beginning of the opera. The creatures of her death scene exited, but they left her bed in the middle of what then became a party scene. Somehow I had trouble believing that a famous nineteenth century character had her bed in an open space where it could be seen by a hundred partygoers. Christine Jones' green walls with their decorative gold vines were spectacular. So were the costumes. Costumer Susan Hilferty clothed not only the principals but also members of the chorus and singers with small parts in highly decorative finery. As Violetta, Diana Damrau wore a low cut, off-the-shoulder reflective white gown and Alfredo's Prussian blue outfit was trimmed in gold. Later, Damrau wore a similarly styled dress in a greyish tan that seemed to fit her socially unacceptable character more fully. Since there was in intermission after Act I, moviegoers ordered and ate an early lunch at their seats in the Phoenix Esplanade Theater. Wearing bright red, Anita Rachvelishvili looked smart and chic as she spoke with Peter Gelb and some of the creative artists involved with this production. Act II opened on the same set as Act I with a few added vines on the walls. The bed was still in the middle of the stage. For the second act, costumes were more countrified, although the setting was still indoors. For the gambling scene, the setting was the same and a surprisingly similar bed was in the middle of Flora's room. The costumes were appropriate to an evening of drinking and cavorting with courtesans. 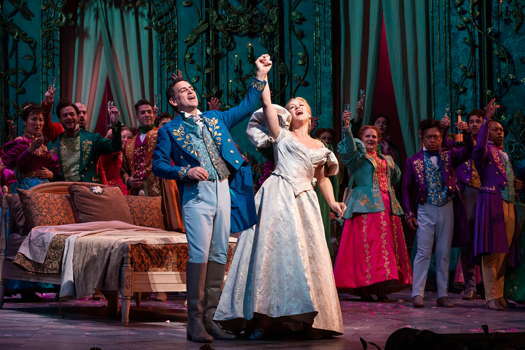 By the final scene of Act III, we knew where to find the seemingly ubiquitous bed. Director Mayer chose to have an actress portray the elder Germont's daughter who is normally only spoken about in the text of the opera. It did cause a problem, however. When Violetta sings 'Dite alla giovane' asking Germont to tell the young girl that she will give Alfredo up so the girl's fiancé will not leave her, the girl is in the room. Thus, it seems out of place when Violetta and Germont speak of her as though she were at home. Damrau has been a fine coloratura singer in the past but for whatever reason in this performance she did not have her highest notes or a trill in her arsenal. Her duet with Kelsey, however, drew huge applause. The opening scene, however, was disappointing except for the singers of smaller parts and the Met's fabulous chorus. Juan Diego Flórez did not have the warmth of tone that I expect from Alfredo, and a short time later, he cancelled a performance. Perhaps he had a cold. In any case, the best singing came from Quinn Kelsey as the elder Germont. His power and resonance was simply glorious. With bronze-tinged tones, he seems to have the perfect range and focus for similar roles - The Verdi Baritone of Our Age. Lorin Latarro's choreography as danced by Garen Scribner and Martha Nichols resulted in one of the most interesting and unusual non-traditional third act ballets I've yet seen. Their movements left little to the imagination, as was fitting for a party at the home of a courtesan. Singers Scott Scully, Dwayne Croft, Kevin Short and Jeongcheol Cha acquitted themselves well. Kirstin Chávez was a seductive Flora and Maria Zifchak a caring Annina. Leading the musical performance was the Metropolitan Opera's new music director, Yannick Nézet-Séguin for whom this production was a debut. Although he began with slow tempi, by the middle of the first act everything fell into place and he gave the Met and cinema audiences a magnificent rendition of Verdi's immortal score. The Big Apple can be confident about the Met's new music director.